Alango Technologies Ltd., a global leader in automotive voice enhancement technology, announced full compliance of its Sound Reinforcement Package (SRP) for In-Car Communication systems with HQS-ICC. The test reports are provided to Alango's customers upon request. Alango SRP technology supports both 1-way and 2-way configurations. 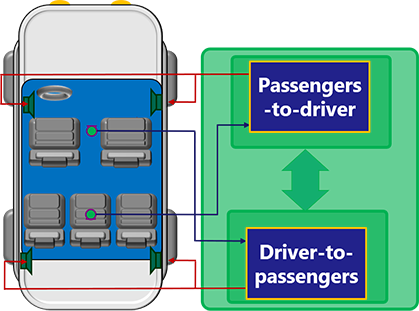 1-way ICC is the reinforcement of driver speech to passengers whereas 2-way ICC additionally includes the reinforcement of passengers’ speech to driver (see Fig. 1.0 below). Both configurations comply with the HQS-ICC proposed standard. In-Car Communication systems have been included in only a few vehicles so far. It’s expected that this accessory will become more widespread among mass market models. ICC systems confront the challenge of driver distraction – one of the major reasons for road casualties in the western world. Driver distraction, often due to belabored in-car communication, is accountable for 3500 deaths and 400,000 injuries annually in just the US, which is about 10% of all deaths and 20% of all injuries. Alango SRP technology is based on 15 years of experience in sound enhancement. It provides an ultra-low algorithmic latency of less than 8 milliseconds and features AVQ (Automatic Volume and Equalization) technology that modifies the system amplification and frequency equalizer to compensate for changing cabin noise strength and spectrum in real time. Dr. Alexander Goldin, Alango Technologies founder and CEO said, "With the current lack of a widely accepted standardization procedure for In-Car Communication systems, Head Acoustics provides car manufacturers and technology providers, such as Alango, a valid benchmark for testing and validation of the technology under realistic conditions. Following the recent successive tests of Alango SRP technology, automotive OEMs and Tier 1’s can integrate Alango’s SRP into their ICC systems with confidence that Alango SRP complies with an emerging objective standard". About Alango: Alango Technologies Ltd., founded in 2002, provides a broad portfolio of licensable front-end voice and audio processing technologies for automotive and other markets. Alango’s technologies improve the quality of voice communication and audio experience in a variety of real life scenarios reducing different types of noise, enhancing speech, cancelling acoustic echo and dynamically equalizing signal volume and spectrum according to dynamic acoustic conditions.